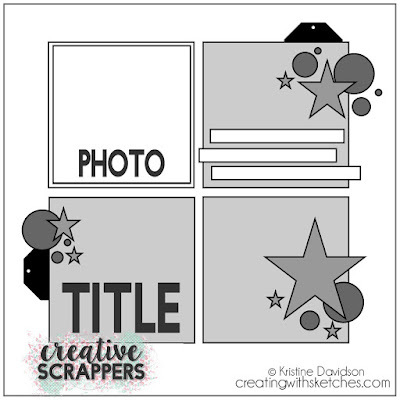 Scrapping With Yvette: Hello Beautiful! I have some exciting news! I were invited to be part of Creative Scrappers Design Team for the next few months. Today I am sharing a layout I made using one of Kristine Davidson sketch, and a Juliana Michaels cut file. I started my layout off by cutting the Butterfly Frenzy cut file from 17 Turtles and it's a freebie. I cut the file in two different sizes, the three smaller ones are about four inches. I made one about ten inches, this I used as my background. On the grids I machine stitch around the edge to form a frame. Supply List: Patterned Paper- Studio Calico-Snippets; Crate Paper- Maggie Holmes- Bloom; Embellishments- Shimelle -cardstock-stickers; Cocoa Vanilla Studio- Totally Rad; My Mind's Eye-My Story - Chipboard Buttons.